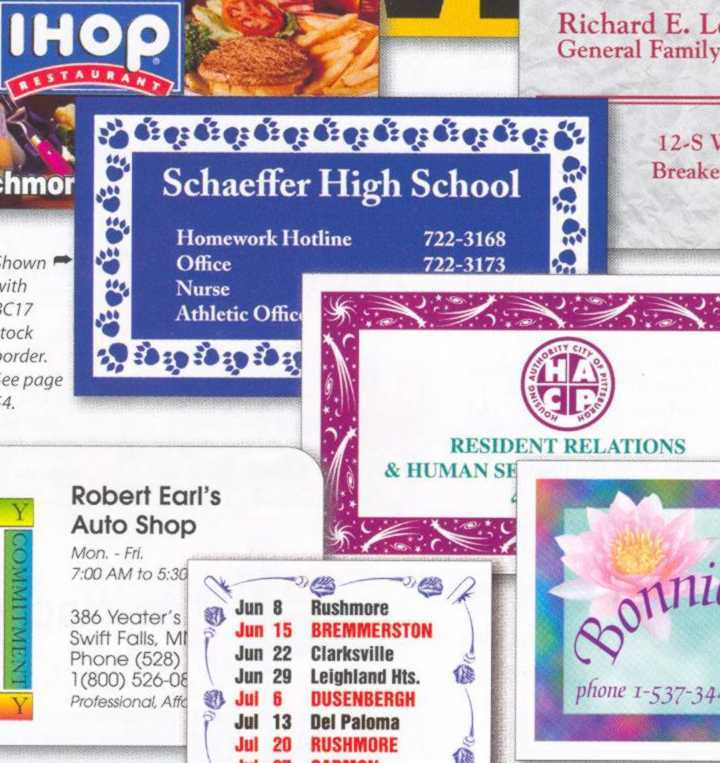 Custom Imprinted Magnetic Business Cards, Promotional, Customized, Personalized, Printed, Advertising. Standard Size Magnetic Business Cards - 3 1/2" x 2"
Prices, colors and quantities subject to change without notice. Imprint Area: Approximate 3 1/8" x 1 5/8". Standard Size Magnetic Business Cards 3 1/2" x 2"
• A must for any type of business. • Bright, bold imprinted messages help promote your business and/or organization..
• White vinyl cover with bright imprint colors. Imprint Colors: Click here to select ink color from the chart, and specify it in your order. (Please notice that the color you are seeing might be slightly different from the actual color, depending on the color of your monitor). If a PMS color match other than our standard colors is required, add $35.00 per color. An exact color match cannot be guaranteed. Custom logo or artwork: Please provide black and white camera ready ( or color separated, if more than one color) artwork to size (see "imprint area" to size your artwork. No halftone artwork). If you need artwork preparation, connect to the following link: Requirements to prepare and/ or to e-mail artwork to us, click here. Packaging and Weight: Bulk, approximate LBS..
Production Time: From receipt of complete order and approved artwork, please allow approx. 10 - 12 working days production time in the plant on custom or imprinted merchandise, unless otherwise noted. Overruns/ Overruns: We reserve the right to ship and bill 5% over or under the ordered amount on custom imprinted merchandise. Order NOW and save time and money! To place your order, click here. Then follow the instructions in the ordering form in each page, or call us at the telephone number shown at the end of each page to place your order.